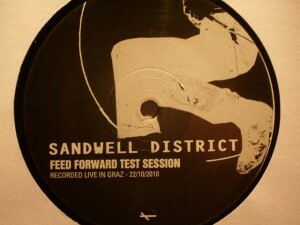 October 2010: Graz and Berlin were the locations for Sandwell District’s (SD) test sessions. For the enjoyment of techno fans, for the days when Santa Claus was visiting, part of the action was made available with this release. And not only this: A single by Function and a full album by SD rounded up the end-of-the-year efforts of the Sandwell District label. It’s a solid techno record. Already first beats of the Berlin-side tell that the guys know the trade. A bold charge with thriving drum patterns that come with slight hiss and are later complemented by atmospheric layers and echoing effects, which do no alter the mood – it’s still a power track. But closer to the end the storm starts to fade and we enjoy a nice sunset in ambient mood. What a pity that the outerlude is so short. Graz-side is switched on with syncopated beats and although it’s not such a roller coaster as the flip, the bass is ever present and squeezes you tightly against the wall. The track goes its way, steam and haze slowly covering the landscape, with deserted factories in the horizon. It might sound so rock’n’roll but some crowd noise from the live recordings would have spiced up the whole thing, especially the Berlin-side. Techno needs new kids but it’s also terrific to learn that long-time producers like Regis and Function, here with Juan Mendez, are still in effect. SD was one of top labels in 2010, indeed.